You know, when a book has endorsements from Cardinal Donald Wuerl, Scott Hahn, Kevin Vost, Marcus Grodi, and Mike Aquilina (to name a few!! ), a thumbs-up from Shane Kapler is obviously superfluous. But in the spirit of “when has that ever stopped me before?” I have to share my deep appreciation of this book. The Christians who impress me most, who really stand out as being especially intimate with God, never say what I expect them to say. Instead of telling me the “a” or “b” I expect, they say something completely original. Their love of God and years of intimacy enable them glimpse ways, paths, where I see only dead ends. That’s what I like about Kevin Lowry and his Faith at Work: Finding Purpose Beyond the Paycheck. Lowry has worn many different hats during his professional life: door-to-door salesman, accountant, senior vice-president at an international company, and now executive vice-president and chief operating officer of The Coming Home Network. Because of that, Kevin shares what he has actually lived. This book is filled with stories and through them, Kevin shares the hard won insights and principles that guide his work life as a Catholic Christian. Assuming that [God] didn’t set us up for failure, it follows that we always have time to do God’s will. If we don’t have time to do everything, there are items on our to-do list that shouldn’t be there, or shouldn’t be there right now. The point is, our lives should follow a sense of calling, and this demands that we prayerfully discern, somewhat precisely, what God wants us to do. In this case, God’s will became clear as we prayed and followed (pp.34-35). 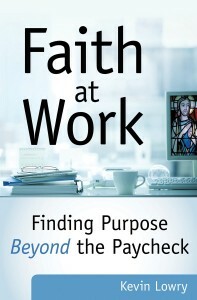 Faith at Work: Finding Purpose Beyond the Paycheck is an extremely good read. It is a rubber-meets-the-road approach for putting God at the center of our daily grind, whatever that grind may be! So for what it’s worth, you can add this Christian’s name to Faith at Work‘s illustrious list of fans. The Assumption of Mary: Our Quintessential Catholic Feast!